In this article, you will learn how to find the next row using VBA. 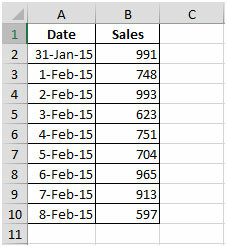 Following is a snapshot of Sales Report wherein the next row after the last row can be identified as 11. In case the user is working on large amount of data & multiple workbooks then, it becomes harder to manually figure out; we need VBA code to help us. or press ALT + F11 shortcut key to launch VB Editor screen. This will create new module. In this way, you can get to know the next available row of the worksheet using VBA code & now, we can use this code in writing larger codes for automation purpose. This is really a good excel tip. I was just trying to write something similar and found your example. Thank you for your excel tips!